Princess Anne looking great in a casual straw hat to present prizes at an eventing circuit competition held on her estate, Gatcomb Park, last Monday. She and Vice Admiral Laurence were spotted in casual sun hats, enjoying the event on Sunday. The “nosai no gi” ceremony for Princess Ayako and Kei Moriya took place today at Princess Hisako’s home in Tokyo. This ceremony, the highlight of engagement rituals followed by the Imperial royal family, includes the exchange of special betrothal gifts (including sea breams, sake and silk) by both families and officially seals the engagement. The young couple and their surviving parents were later spotted arriving at the Imperial Palace for a visit with the Emperor and Empress, Princess Ayako in a white jacquard silk bumper hat with rosettes, braided trim and a tufts of tulle veil. Princess Hisako wore an interesting hat covered in melon-hued silk with rolled brim wrapped in white organza. We can usually count on Princess Camilla of Bourbon Two-Sicilies to sport some interesting fashion during her family’s annual vacation in Saint-Tropez- while she didn’t disappoint this year, I really do like her sun hat. Queen Elizabeth was spotted en route to church in Scotland today in a new pale blue hat with black trim. She was joined by Princess Beatrice who looked very fashionable in a wide brimmed, dark Garbo hat. She also debuted a new cream and blue hat for church last Sunday that you won’t want to miss. 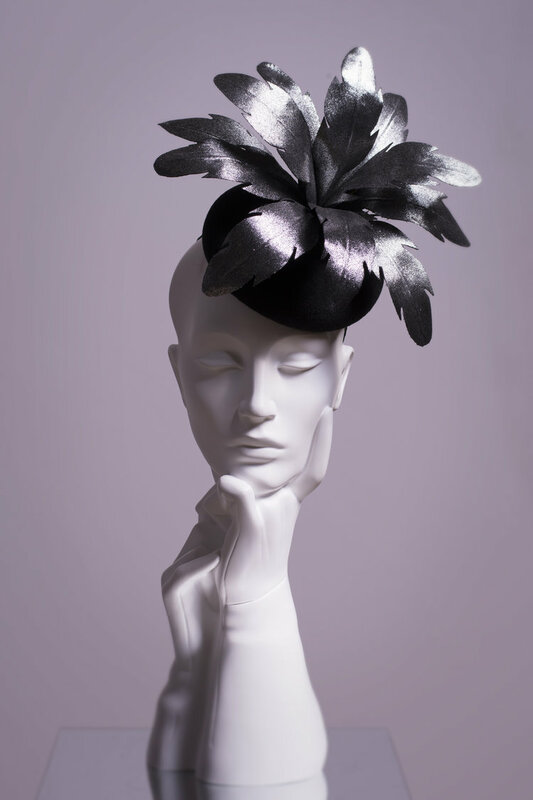 And from Jane Fryers Millinery, this striking green and black beret base percher made of fish leather- leather made from fish skin, something that is usually discarded in the fishing industry. Crown Prince Frederik and Crown Princess Mary shared numerous snaps of their family’s visit to the Knuthenborg Safaripark. I’ve been on vacation this week and not tuned closely into royal news- I trust you will all fill in the gaps I’ve missed! 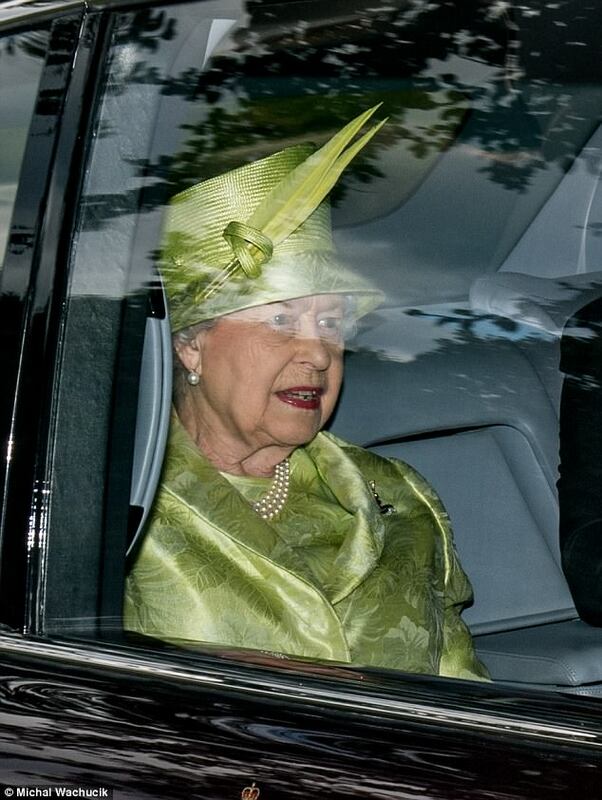 Queen Elizabeth attended church this morning in a lime green straw cloche with stovepipe crown, silk covered brim and feather trim we’ve not seen for a long time. 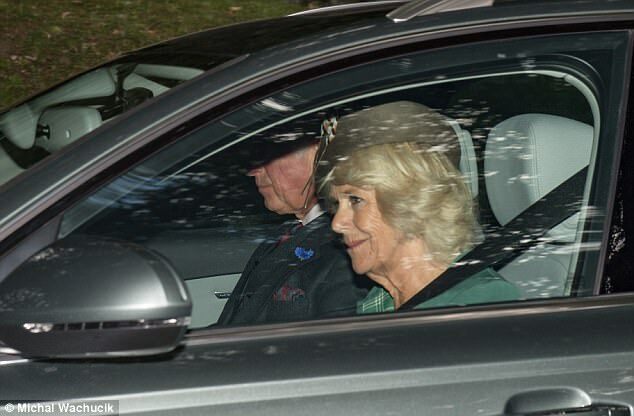 The Duchess of Cornwall wore a taupe straw beret percher that I think was new. Earl of Wessex attended the first performance of the 2017 Royal Edinburgh Military Tattoo in the grounds of Edinburgh Castle. The Earl of Wessex has been in Edinburgh, where he attended the first performance of the 2017 Royal Edinburgh Military Tattoo in the grounds of Edinburgh Castle. The @edinburghtattoo is an annual series of military performances by the British Armed Forces, Commonwealth and international military bands that forms part of the Edinburgh Festival. Also in Edinburgh, The Earl, Patron of the Edinburgh International Festival, attended the opening concert of the 2017 Festival. 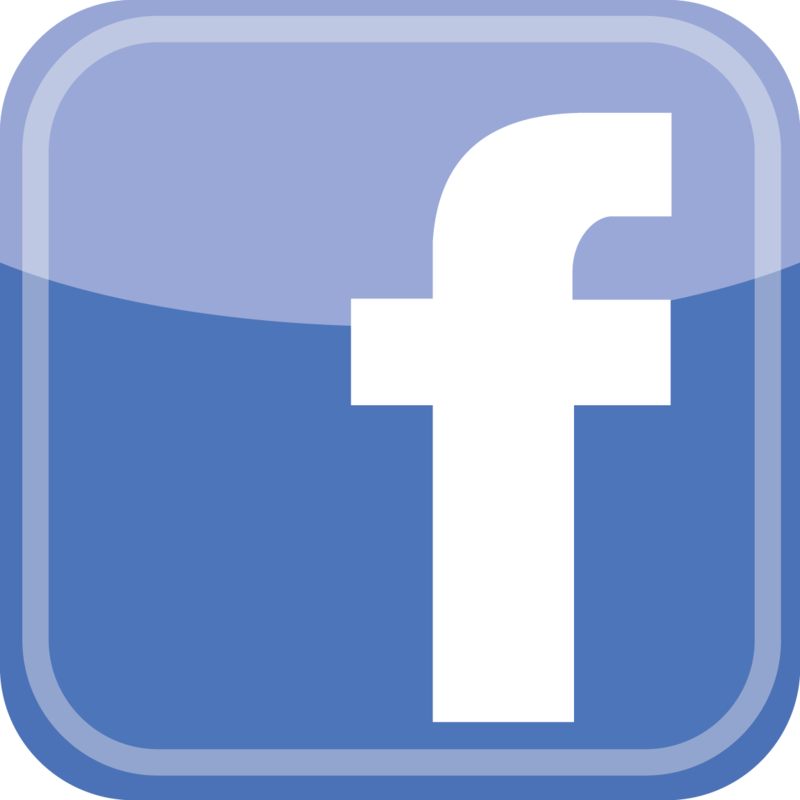 2017 marks the 70th anniversary of the festival and the opening concert of Haydn’s ‘Surprise’ Symphony and Mendelssohn's Symphony No 2 ‘Lobgesang’, also opened the first festival in 1947. The Earl became the @edintfest Patron earlier this year, making him the third Royal Patron, following The Queen and Queen Elizabeth The Queen Mother. Prince Laurent landed himself in hot water again (Politico.eu) while Prince Henrik of Denmark added more fuel to the fire set by his recent announcement he won’t be buried with his wife (The Independent). I’ll refrain from adding commentary except to refer to Royal Musings’ response to Henrik’s latest interview. ‘Nuff said. Members of Monaco’s royal family celebrated their country’s national holiday today with a Thanksgiving Mass at Cathedral Notre-Dame, a parade in the royal palace courtyard and a greeting from the palace balcony. Princess Charlene chose a new hat for these celebrations, a sleek cloche in claret wool trimmed with a grey birdcage net veil that encases the piece. The classic 1920s shape and style of the hat is made current and modern by the veil and a side slit in the cuffed brim. This is not an easy hat to wear but it works so well with Charlene’s face shape, new pixie haircut, flapper-esque dropped waist dress and demure jewellery. I think this is vintage-modern royal millinery at its best. Princess Caroline of Hanover and Monaco topped her Chanel coat with a fascinator made of black feathers formed into flowers. While I would have preferred her in a more traditionally shaped hat with this outfit for this occasion, this fascinator frames her face nicely and she wears it well. Beatrice Borromeo topped an elegant black and beige suit with a beige felt moulded beret worn on the side of her head. The hat has an air of austerity about it that was balanced well with Beatrice’s drop earrings- while I would have loved a feather or some sort of trim on the hat, it fit very well with her elegantly streamlined ensemble. Princess Camilla of Bourbon-Two Sicilies, a long time friend of Prince Albert often spotted at Monaco royal events with her husband Prince Carlo, Duke of Castro, was her characteristically bold self in a black and white ensemble. Camilla’s white pillbox-style hat featured an open crown, black stripes, and black feather trim. I’m not usually a fan of open-topped hats but this one seems to work well with Camilla’s upswept hairstyle and bold dress and coat. Baroness Elisabeth-Anne de Massy (Prince Albert’s first cousin, the daughter of his father’s sister Princess Antoinette) wore a grey felt Garbo style hat with floppy brim and side pouf trim. Her daughter, Mélanie-Antoinette Costello de Massy wore a black felt hat of similar shape trimmed with a brooch pinned at the side. The two women are picture below on either side of Princess Charlene. As you can also see below, both Charlotte Casiraghi and Princess Stephanie were in attendance but neither wore a hat. It looks like a lovely day was had by all in Monaco although the hats might have been overshadowed by a certain pair of royal twins who appeared on the balcony! What do you think of the royal millinery spotted in Monaco today? Queen Elizabeth and the Duke of Edinburgh arrived at Balmoral last weekend to begin their annual Scottish summer vacation (Daily Mail). The Queen wore a Rachel Trevor Morgan hat for her arrival and her cream straw hat with lattice brim for Sunday Service at Crathie Kirk (The Press & Journal). Shock waves from Romania as King Michael strips Prince Nicholas of his title and place in succession (Telegraph). Sentiments toward the young man seem to have changed dramatically since Crown Princess Margarita wrote kindly about him in this chapter of his book, The Road Home.